A formal ceremony is held in Washington to welcome China's president, Hu Jintao, held at the South Lawn of the White House. Chinese President Hu Jintao says Beijing and Washington should respect each country's "core interests" as he begins a three-day U.S. visit at the White House. "The United States welcomes China's rise as a strong, prosperous and successful member of the community of nations," Obama said. "Indeed, China's success has brought with it economic benefits for our people as well as yours, and our cooperation on a range of issues has helped advance stability in the Asia Pacific and in the world." Hu said his visit was intended to "increase mutual trust, enhance friendship, deepen cooperation and push forward the positive, cooperative and comprehensive China-U.S. relationship for the 21st century." The Chinese president stated, "Our cooperation as partners should be based on mutual respect." Hu said, "We live in an increasingly diverse and colorful world. China and the United States should respect each other's choice of development path and each other's core interests." Washington -- US President Barack Obama hailed the President of the People's Republic of China's visit as a chance to lay a foundation for the next 30 years of Sino-American relations. "At a time when some doubt the benefits of cooperation between the United States and China, this visit is ... a chance to demonstrate a simple truth," Obama said. "We have an enormous stake in each other's success. In an interconnected world, in a global economy, nations -- including our own -- will be more prosperous and more secure when we work together." Hu declared the relationship between the two powers to be one of "strategic significance and global influence." Under "new circumstances, and in the face of new challenges, China and the United States share broad common interests and important common responsibilities," he said. "Our cooperation as partners should be based on mutual respect," he added. "China and the United States should respect each other's choice of development path and each other's core interests." Obama will host a formal state dinner for Hu on January 19, the conclusion of a long day including bilateral talks and a joint news conference. The Chinese leader is on a three-day trip to the United States for meetings on trade, currency, strategic mutual trust, North Korea, and other international issues. 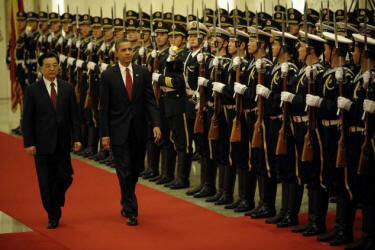 It will be the eighth face-to-face meeting between Hu and Obama. While in Washington, Hu will stress the importance of a comprehensive partnership between the two nations to help ensure stability worldwide, Chinese state media reported, despite their differences on a number of issues. In addition to Obama, the Chinese leader is scheduled to meet with top legislators and business executives, and to address trade and economic concerns at the US-China Business Council. The Chinese president will also visit Chicago. On January 18, Hu attended a dinner at the White House with Obama, Secretary of State Hillary Clinton and National Security Adviser Tom Donilon. The state dinner will be the third such event held during the Obama administration. The last White House state dinner for China was 13 years ago, when President Bill Clinton welcomed President Jiang Zemin and his wife, Wang Yeping, in October 1997. Both leaders repeatedly emphasized their intentions to deepen their cooperation, even as they continue to disagree on many aspects of their nations' complex relationship. Obama reiterated that the United States does not intend to try to "contain" China, but hopes to benefit from its rapid and peaceful growth. China and the United States reiterated their commitment to the promotion and protection of human rights, despite significant differences on these issues. Addressing a joint press conference with U.S. President Barack Obama, Hu asserted that his country has made major progress on human rights issues recognized widely in the world. Hu underlined the fact that China has made "enormous progress, recognized widely in the world." At the same time, he noted that other countries should adhere to the principle of noninterference in other nations' internal affairs. "China recognizes and respects the universality of human rights. And at the same time, we do believe that we also need to take into account the different national circumstances when it comes to the universal value of human rights," Hu said. Noting that China is a developing country with a huge population and in a crucial stage of reform, Hu said China faces many challenges in economic and social development, and a lot still needs to be done in China in terms of human rights. Chinese President Hu also committed to easing regulations to increase foreign firms' access to Chinese markets. The two leaders, in their eighth meeting, held their ground on other issues. President Obama repeated his assertions that the Chinese currency is undervalued, and that China needs to take steps to see that competition between the two powers is on a "level playing field." After a year of strife between the governments over economic, security and human rights issues, the summit was designed to stabilize what is considered the world's most important economic relationship. PRESIDENT OBAMA: Good afternoon. It is my pleasure to welcome President Hu to the White House and to return the hospitality that he showed when I visited China last year. This is our eighth meeting. Together we’ve shown that the United States and China, when we cooperate, can receive substantial benefits. The positive, constructive, cooperative U.S.-China relationship is good for the United States. We just had a very good meeting with the business leaders from both our countries. They pointed out that China is one of the top markets for American exports. We’re now exporting more than $100 billion a year in goods and services to China, which supports more than half a million American jobs. In fact, our exports to China are growing nearly twice as fast as our exports to the rest of the world, making it a key part of my goal of doubling American exports and keeping America competitive in the 21st century. Cooperation between our countries is also good for China. China’s extraordinary economic growth has lifted hundreds of millions of people out of poverty. And this is a tribute to the Chinese people. But it’s also thanks to decades of stability in Asia made possible by America’s forward presence in the region, by strong trade with America, and by an open international economic system championed by the United States of America. Cooperation between our countries is also good for the world. Along with our G20 partners, we’ve moved from the brink of catastrophe to the beginning of global economic recovery. With our Security Council partners, we passed and are enforcing the strongest sanctions to date against Iran over its nuclear program. We’ve worked together to reduce tensions on the Korean Peninsula. And most recently, we welcomed China’s support for the historic referendum in southern Sudan. As we look to the future, what’s needed, I believe, is a spirit of cooperation that is also friendly competition. In areas like those that I just mentioned, we will cooperate -— forging partnerships and making progress that neither nation can achieve alone. In other areas, we’ll compete -— a healthy competition that spurs both countries to innovate and become even more competitive. That’s the kind of relationship I see for the United States and China in the 21st century, and that’s the kind of relationship that we advanced today. I am very pleased that we’ve completed dozens of deals that will increase U.S. exports by more than $45 billion and also increase China’s investment in the United States by several billion dollars. From machinery to software, from aviation to agriculture, these deals will support some 235,000 American jobs. And that includes many manufacturing jobs. So this is great news for America’s workers. I did also stress to President Hu that there has to be a level playing field for American companies competing in China, that trade has to be fair. So I welcomed his commitment that American companies will not be discriminated against when they compete for Chinese government procurement contracts. And I appreciate his willingness to take new steps to combat the theft of intellectual property. We discussed China’s progress in moving toward a more market-oriented economy and how we can ensure a strong and balanced global economic recovery. We agreed that in China, this means boosting domestic demand; here in the United States, it means spending less and exporting more. I told President Hu that we welcome China’s increasing the flexibility of its currency. But I also had to say that the RMB remains undervalued, that there needs to be further adjustment in the exchange rate, and that this can be a powerful tool for China boosting domestic demand and lessening the inflationary pressures in their economy. So we’ll continue to look for the value of China’s currency to be increasingly driven by the market, which will help ensure that no nation has an undue economic advantage. To advance our shared security, we’re expanding and deepening dialogue and cooperation between our militaries, which increases trust and reduces misunderstandings. With regard to regional stability and security in East Asia, I stressed that the United States has a fundamental interest in maintaining freedom of navigation, unimpeded commerce, respect for international law and the peaceful resolution of differences. I welcomed the progress that’s been made on both sides of the Taiwan Strait in reducing tensions and building economic ties. And we hope this progress continues, because it’s in the interest of both sides, the region and the United States. Indeed, I reaffirmed our commitment to a one-China policy based on the three U.S.-China communiqués and the Taiwan Relations Act. I told President Hu that we appreciated China’s role in reducing tensions on the Korean Peninsula, and we agreed that North Korea must avoid further provocations. I also said that North Korea’s nuclear and ballistic missile program is increasingly a direct threat to the security of the United States and our allies. We agreed that the paramount goal must be complete denuclearization of the peninsula. In that regard, the international community must continue to state clearly that North Korea’s uranium enrichment program is in violation of North Korea’s commitments and international obligations. With respect to global security, I’m pleased that we’re moving ahead with President Hu’s commitment at last year’s Nuclear Security Summit for China to establish a center of excellence, which will help secure the world’s vulnerable nuclear materials. To prevent the spread of nuclear weapons, we agreed that Iran must uphold its international obligations and that the U.N. Security Council sanctions on Iran must be fully enforced. Along with our P5-plus-1 partners, we’ll continue to offer the government of Iran the opportunity for dialogue and integration into the international community, but only if it meets its obligations. I reaffirmed America’s fundamental commitment to the universal rights of all people. That includes basic human rights like freedom of speech, of the press, of assembly, of association and demonstration, and of religion -- rights that are recognized in the Chinese constitution. As I’ve said before, the United States speaks up for these freedoms and the dignity of every human being, not only because it’s part of who we are as Americans, but we do so because we believe that by upholding these universal rights, all nations, including China, will ultimately be more prosperous and successful. So, today, we’ve agreed to move ahead with our formal dialogue on human rights. We’ve agreed to new exchanges to advance the rule of law. And even as we, the United States, recognize that Tibet is part of the People’s Republic of China, the United States continues to support further dialogue between the government of China and the representatives of the Dalai Lama to resolve concerns and differences, including the preservation of the religious and cultural identity of the Tibetan people. Finally, we continue to expand partnerships between our people, especially our young people. Today, my wife Michelle is highlighting our efforts to increase the number of American students studying in China to 100,000. And I am very pleased that President Hu will be visiting my hometown of Chicago. Mr. President, you are brave to visit Chicago in the middle of winter. I have warned him that the weather may not be as pleasant as it is here today. (Laughter.) But I know that in the students and the businesspeople that you meet, you will see the extraordinary possibilities of partnership between our citizens. So, again, I believe that we’ve helped to lay the foundation for cooperation between the United States and China for decades to come. And Michelle and I look forward to hosting President Hu for a state dinner tonight to celebrate the deep ties between our people, as well as our shared hopes for the future. PRESIDENT HU: (As translated.) Friends from the press, ladies and gentlemen, good afternoon. First of all, I want to express sincere appreciation to President Obama and the government and people of the United States for the warm welcome accorded to me and my colleagues. Just now I have had talks with President Obama in a candid, pragmatic and constructive atmosphere. We had an in-depth exchange of views and reached important agreement on China-U.S. relations, and major international and regional issues of shared interest. We reviewed the development of China-U.S. relations in the last two years. We positively assessed the progress we made in dialogue, coordination and cooperation in various areas. The Chinese side appreciates President Obama’s commitment to a positive and constructive China policy, and to stable and growing China-U.S. relations since he took office. Both President Obama and I agree that as mankind enters the second decade of the 21st century, the international situation continues to undergo profound and complex changes and there is a growing number of global challenges. China and the United States share expanding common interests and shoulder increasing common responsibilities. China-U.S. cooperation has great significance for our two countries and the world. The two sides should firmly adhere to the right direction of our relationship; respect each other’s sovereignty, territorial integrity and development interests; promote the long-term sound and steady growth of China-U.S. relations; and make even greater contributions to maintaining and promoting world peace and development. We both agree to further push forward the positive, cooperative and comprehensive China-U.S. relationship and commit to work together to build a China-U.S. cooperative partnership based on mutual respect and mutual benefit, so as to better benefit people in our own countries and the world over. We both agree to strengthen exchanges and cooperation in economy and trade, energy and the environment, science and technology, infrastructure construction, culture and education, counterterrorism, nonproliferation, law enforcement and other areas so as to achieve mutual benefit. During my current visit to the United States, the relevant departments, institutions and enterprises of the two countries have signed a number of cooperation agreements and reached agreement on a series of new cooperation projects. These will inject fresh momentum into our bilateral cooperation and create a great many job opportunities for both countries. We discussed some disagreements in the economic and trade area, and we will continue to appropriately resolve these according to the principle of mutual respect and consultation on an equal footing. The President and I agree that China and the United States need to establish a pattern of high-level exchanges featuring in-depth communication and candid dialogue. President Obama and I will stay in close contact through meetings, telephone calls and letters. The two sides believe that the expansion of exchanges and cooperation between our militaries contribute to deepening mutual trust between our two countries and to the growth of our overall relationship. We also agreed to encourage all sectors of our society to carry out various forms of exchange activities. In particular, we have high hopes on the young people, hoping that they will better understand each other’s country and be more deeply involved in the people-to-people exchanges between our two countries. President Obama and I exchanged views on the international economic situation. We believe the world economy is slowly recovering from the international financial crisis, but there are still a fair amount of unstable factors and uncertainties. Both sides agree to strengthen microeconomic policy coordination and actively pursue opportunities for greater cooperation in this process. The two sides support the G20 playing a bigger role in international economic and financial affairs. We agree to push forward reform of the international financial system and improve global economic governance. We champion free trade and oppose protectionism, and we hope the Doha Round of negotiations can make early and substantive progress. President Obama and I exchanged views on major international and regional issues, including the situation on the Korean Peninsula, the Iranian nuclear issue, climate change and others. We agree to strengthen consultation and coordination on major issues that concern peace and development in the Asia Pacific region and in the world. China and the United States will enhance coordination and cooperation and work with the relevant parties to maintain peace and stability on the peninsula, promote denuclearization of the peninsula, and achieve lasting peace and security in Northeast Asia. We will work with the United States and other countries to effectively address global challenges, such as meeting the climate challenge, terrorism, transnational crime, energy and resource security, food security, public health security and serious natural disasters, so as to forge a bright future for the world. I stated to the President that China is firmly committed to the path of peaceful development and a win-win strategy of opening up. China is a friend and partner of all countries, and China’s development is an opportunity for the world. U.S. President Barack Obama with Chinese President Hu Jintao during a welcome ceremony at the Great Hall of the People in Beijing, China. 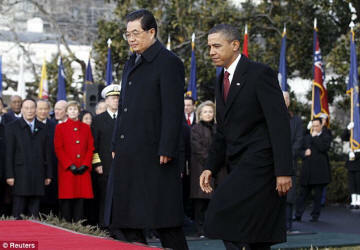 At the invitation of President Hu Jintao of the People’s Republic of China, President Barack Obama of the United States of America is paying a state visit to China from November 15–18, 2009. The Presidents held in-depth, productive and candid discussions on U.S.-China relations and other issues of mutual interest. They highlighted the substantial progress in U.S.-China relations over the past 30 years since the establishment of diplomatic ties, and they reached agreement to advance U.S.-China relations in the new era. President Obama will have separate meetings with Wu Bangguo, Chairman of the Standing Committee of the National People’s Congress and Premier Wen Jiabao. President Obama also spoke with and answered questions from Chinese youth. The two sides welcomed the signing of the Memorandum of Cooperation between the Environmental Protection Agency of the United States and the National Development and Reform Commission of China and to Build Capacity to Address Climate Change. Chinese President Jiang Zemin and US President Bush had talks in Shanghai this morning. The meeting was the first between the two heads of state. They had in-depth exchange of views on important issues concerning Sino-US relations, antiterrorism, and safeguarding world peace and stability. Jiang Zemin said: China attaches great importance to developing relations with the United States and always maintains that the two countries should develop a constructive and cooperative relationship. To this end, the two sides may create the mechanism governing high-level strategic dialogue so that President Bush and I, or the representatives we designate, can exchange views and have prompt communication on important issues of common concern. Jiang Zemin said: We are living in a diverse and colorful world. China and the United States are likely to have differences, but we must coexist on a long-term basis. When we have different views, we should seek our similarities and reserve our differences, and make constant efforts to expand our common grounds. History has proved that our relations will develop if we do so. Jiang Zemin said: Ever since China embarked on reforms and opening up, China has achieved significant developments. Shanghai is a vivid microcosm of the developments in China. China attaches great importance to developing economic and trade cooperation with the United States. Our recent purchase of 30 Boeing airplanes is an indicator that Sino-US economic and trade cooperation will have broad prospects. On antiterrorism, Jiang Zemin said: China always is against all forms of terrorism, and China supports the strikes against terrorism. Only when the blows against terrorism are accurately dealt can they be effective. Efforts should be made so that innocent people will not be hurt. China and the United States may build a mechanism governing intermediate and long-term cooperation in fighting terrorism. Bush indicated that he had been looking forward to making this trip to China so that he could have face-to-face talks with President Jiang. Bush stressed: The US Government attaches great importance to its relations with China. China is a great country. China is not an enemy of the United States. He said he regards China as a friend of the United States. The United States is working for developing a constructive and cooperative relationship with China. Without a doubt, there will be differences between the United States and China. But we will handle our differences in the spirit of respecting each other and treating each other with candor. Bush said he has always been strongly supportive for China's membership in the World Trade Organization [WTO]. He congratulated China for becoming a WTO member very soon, saying that China's WTO membership will be beneficial to both China and the United States. He also congratulated China for successfully bidding the sponsorship of the Olympic Game. Bush thanked China for the prompt response it made to express China's unequivocal and firm support for the American people in fighting terrorism after the terrorist attacks in the United States on 11 September. He also thanked China's cooperation in that respect. Jiang Zemin said: The Taiwan issue has always been the most sensitive issue in Sino-US relations. The basic principle China follows in settling the Taiwan issue has always been one characterized by "peaceful reunification; and one country, two systems." We hope the United States will abide by the policy of one China and abide by the three Sino-US joint communique. Bush indicated that he came to China this time to reaffirm China that the US Government adheres to the policy of one China and will abide by the three joint communique. Following the talks, Jiang Zemin and Bush attended a joint press conference. [Chinese President Jiang Zemin] President Bush and I had a very good talk. It was our first meeting. We had in-depth exchange of views on important issues, such as Sino-US relations, antiterrorism, safeguarding world peace and stability. We also achieved consensus on a string of issues. China and the United States, two most influential countries in the world, have common responsibilities to bear and common interests to share with respect to safeguarding peace and security in the Asia-Pacific region and the world at large, to promoting regional and global economic development and prosperity, and to working with the international community in rebuffing terrorism. China attaches great importance to developing relations with the United States and wants to work with the United States in developing a constructive and cooperative relationship between the two countries. We are living in a diverse and colorful world. Since the situations of China and the United States differ, it is not strange at all that we have differences. We maintain that all civilizations and social systems should coexist on a long-term basis and seek common development while seeking similarities and reserving differences. Sino-US relations are facing important opportunities for development. We will carry out high-level strategic dialogue, promote exchanges and cooperation in economic, trade and other areas, and intensify our consultations and coordination while handling important international and regional issues. I believe that as long as the two sides bear firmly in mind the two countries' common interests and handle issues about the two countries' relations, and especially the Taiwan issue, according to the three Sino-US joint communique, Sino-US relations will develop. Shanghai today because I think China and other countries in the Asia-Pacific region are important antiterrorist partners. The other reason I came here is because I think the future of my country's economic development is closely associated with the future of Asia's economic development. I think the United States and Asian countries are facing a common threat, but we are full of common hopes. We all need a more prosperous and more peaceful era. I thank you for setting aside time to receive me and hold talks with me. I know you, the Shanghai government, and the Shanghai authorities did a very good job in Shanghai. Shanghai is a very exceptional city. The last time I came here was 25 years ago. In those days I just could not imagine that Shanghai can look like this today in 2001. Shanghai is a city that gives people a deep impression. This should be credited to the leaders in Shanghai, and of course, to you too, President Jiang, because you were mayor of Shanghai. The United States and China agree that international terrorism is a huge threat facing all of us. I believe that the United States and China should join hands to rebuff this common threat. I think that we can do a lot of important things when we cooperate in such a manner. After the September 11 attacks occurred, the Chinese President and the Chinese Government and people responded immediately. At that time they responded without the least hesitation to pledge that they would stand on the side of the American people and the American Government. The Chinese Government has made a firm commitment to cooperating with the United States. This includes sharing information and also cutting the terrorists' financial sources. President Jiang and the Chinese Government are now working shoulder to shoulder with the American people and American Government in rebuffing the evil terrorists. China is a great, strong country. A constructive US-Chinese relationship is what the United States wants. China's wish to join the international community and coexist in harmony with its neighbors is what we welcome. We also welcome China to join the World Trade Organization as soon as possible. We think this and other developments are good for the two peoples, and even the people the world over. From a long-term point of view, whether or not China will become even more prosperous depends on whether China is fully assimilated with the international community and will fully abide by the international guiding principles. Likewise, from a long-term point of view, economic freedom and political freedom complement each other. Today we have discussed many issues, including the issue that the antiterrorist war should not be used as an excuse for persecuting minorities. I have expounded my position, my clear-cut position on Taiwan, and the stability in East Asia. I also emphasized the need to crack down on the proliferation of weapons of mass destruction and missile technology. Today's meeting makes me believe that we can do even more in areas where we have common interests. There cannot be 100 percent agreement between two great countries on all issues. I can understand this. But I want to indicate to President Jiang my pledge that, when we handle our differences and our mutual problems, we will do so with respect and will treat each other with respect. The US-Chinese relationship we are after is an open, constructive, and cooperative relationship. The time when I left the United States was a very difficult time for the United States. But the meeting here is very important. It is important because the campaign against terrorism is very important. At the same time, the relationship between two great countries is also extremely important. One other reason is that we believe business and trade will bring us many opportunities and hopes. President Jiang, I regret that I cannot accept your invitation to visit Beijing this time. But I am sure that I will visit Beijing someday. [President Jiang Zemin] Next time. [President Bush] Thank you for your hospitality. THE PRESIDENT: Good afternoon. Please be seated. Premier Zhu and members of the Chinese delegation, I want to thank you again for coming to the United States. It is important for the leaders of America and China to meet regularly. Today we were able to make progress in areas that benefit both the American and Chinese people. We had the chance to speak directly and openly on matters where we have disagreements. We reviewed our ongoing efforts to enhance the security of both our nations, and to build world peace and stability -- in our efforts to seek peace on the Korean Peninsula, to work with India and Pakistan to curb their nuclear competition, to join in adherence to international agreements limiting the spread of weapons of mass destruction. In that regard, let me say I hope that both our nations soon will ratify the Comprehensive Test Ban Treaty to end all nuclear testing. We also discussed our common efforts to increase prosperity for both our nations. Economic is Premier Zhu's primary portfolio. With his leadership, China's economy has withstood Asia's financial turmoil and helped to mitigate its impact on other nations in the region. Now, with Asia's recovery underway, but regional growth still fragile, Premier Zhu has been squarely addressing China's toughest economic challenges -- reforming state-owned industries and financial institutions, rooting out corruption, bringing China into the Information Age, and expanding international trade. These efforts will benefit China and its trading partners, including America's businesses, workers and farmers. Our nations also will benefit from new cooperative initiatives we have agreed upon in recent days -- to develop a private housing market in China; to create a U.S.-China dialogue on job training and labor rights; to support clean energy projects in China. Today we will sign a civil aviation agreement that will double passenger and cargo flights between our countries, bringing jobs and economic activity to both. And after extensive efforts by our negotiators, China has agreed to direct all its government agencies to use only licensed computer software, which will greatly assist our software industry in China, now the world's fifth-largest personal computer market. Additionally, we have reached an important agreement that will open China's markets for U.S. exports of citrus, meat products, and Pacific Northwest wheat, all highly important for our farmers. I am also pleased we have made significant progress toward bringing China into the World Trade Organization on fair commercial terms, although we are not quite there yet. A fair WTO agreement will go far toward leveling the playing field for our companies and our workers in China's markets; will commit China to play by the rules of the international trading system, and bring China fully into that system in a way that will bring greater opportunity for its citizens and its industries as well. Today, we are issuing a joint statement recording the significant progress we have made on WTO and committing to work to resolve all remaining issues this year. Ultimately, to succeed in the market-based, information-driven world economy, China must continue its efforts toward reform. Premier Zhu has worked very hard on them. There is still work to be done, and we want to support China in its efforts to strengthen its legal system, impose stronger labor and environmental protections, improve accountability, give citizens greater freedom and increase their access to information. We disagree, of course, on the meaning and reach of human rights, because I am convinced that greater freedom, debate and openness are vital to improving China's citizens' lives as well as China's economy over the long run. It is troubling that in the past year, China has taken some steps backwards on human rights and arresting people basically for seeking to express their political views. I also regret that more progress has not been made to open a dialogue with the Dalai Lama. We honor China's remarkable achievements, its greater prosperity and the greater range of personal choices available to its citizens, as well as the movement toward local democracy. We appreciate the magnitude of its struggles, far greater than those faced by any other country in the world. But the American people and, indeed, people all around the world, believe that all persons are entitled to fundamental freedoms that include freedom of speech, religion and association. I hope that China's leaders will conclude that in these areas, too, benefits of change outweigh the risks. I hope and believe we can make the kind of progress together that will enable both of us to have the kind of strong partnership that would be very much in the world's interest in the 21st century -- a partnership against war and terrorism, against dangerous weapons and crime, far better health care and education, for a cleaner environment, achievements in the arts and the sciences, a deepening of democratic values and prosperity for all our citizens and indeed, for all the world. I have no illusions that cooperation with China can resolve all of our differences. Our countries are too large, our backgrounds are too different. Where our interests diverge, we will continue to stand for our values and to protect our national security. But a policy of confrontation for confrontation's sake, as I said yesterday, will accomplish nothing but the fulfillment of the bleakest prophesies held by people in both the United States and China. Yesterday I said we should not see this relationship through rose-colored glasses, nor should we see it through a glass darkly. We should see it with clear eyes. It is in the interest of the American people and the Chinese people that whenever we can cooperate, we should. This relationship, complex though it may be, is profoundly important to the future of every American and every Chinese citizens, and indeed, to all the world. PREMIER ZHU: Thank you. Ladies and gentlemen, I'd like to thank President Clinton for his invitation, and now the delegation of the People's Republic of China is visiting the United States. And today I'm very honored to join President Clinton, to meet all the friends coming from the press. And I am ready to convey through the friends from the media my most sincere greetings and best regards to the American people. From the moment since I set foot on the American soil, which started from Los Angeles -- when maybe God did not welcome me very much, for it rained very hard -- but it appears to me that the American people like me. And today, we received a very grand welcome from the President and we had a very good talk with the President and his colleagues. And at noon, I also attended a very grand luncheon hosted by Secretary Albright, which was an opportunity for me to meet many old friends. I believe that our talks were frank and candid, and they were constructive and fruitful. Naturally, the result has not been measured by how many agreements we may have reached -- I believe we've already reached quite a number of agreements. What is the key that the PRC delegation is able to have the opportunity of meeting people from different walks of life in the United States and that we can have an opportunity to talk directly to the American people to explain to them what is our views. As I said in the morning, it is not that only friends who say yes to you are good friends; we believe that maybe the friends who are able to say no to you are the best friends for you. And from Washington, I will also travel to Denver, to Chicago, to New York and to Boston where I will meet quite a lot of friends from the United States. I'm ready to talk to them, and I'm also prepared to argue, to debate with them. I believe by doing so, we will be able to promote the communication and mutual understanding between our two peoples, thus promoting the relationship between us -- or, rather, the objectives of working to build a constructive strategic partnership between the two sides as opened up by the two Presidents, and also to continue to develop the friendship between us. As the President said earlier this morning, we also reached certain agreements on the WTO question, and we shall issue a joint statement. On this question and also on these areas we've already agreed upon, such as on the agricultural questions, we will sign certain agreements. In my view, all these will further promote the development of friendship and cooperation between China and the United States. And today I am ready to answer your questions in a very candid manner. But as the Premier of China, I took my office only on the 17th of March last year, and today is my first time to experience such press conference -- so my heart is now beating. (Laughter.) I'm not as experienced as the President, because the President is very experienced in dealing with you. (Laughter.) I'm not that experienced, so should I say something which is not appropriate very much, I do hope that you will exercise certain leniency and try to promote what is good and try as much as you can to cover what may not be that appropriate. Thank you. SECRETARY ALBRIGHT: Mr. Premier; Madame Lao; members of the Chinese delegation; Ambassador Sasser; colleagues and guests, I am delighted to welcome you to the Department of State. Mr. Premier, I know that you were formally received at the White House this morning, and I hope you will not be too disappointed in your reception here. Unfortunately, the security people do not allow us to salute State Department visitors with cannon fire. (Laughter). So we welcome you quietly, but warmly, nevertheless. This is the 20th year of relations between the United States and the People's Republic of China. This anniversary brings back some memories for me because two decades ago, I was a member of the National Security Council staff in the Carter Administration with my very good friend, Professor Michel Oksenberg. I remember that our decision to normalize was very controversial. But President Carter was firm in predicting that this decision would contribute to the well-being of both our countries and to the advancement of world peace. China's leadership expressed similar confidence and both were right. Since then, much has been accomplished, especially in recent years under President Clinton and President Jiang. We have strived to curb the proliferation of weapons of mass destruction. We've cooperated in efforts to maintain stability on the Korean Peninsula. We're partners in the fight against international terror and crime. We consult regularly on transnational problems such as safeguarding the global environment. We are deeply engaged on economic issues. You, Mr. Premier, are the architect of many of China's ongoing economic reforms. Your leadership has helped China play a responsible role in the Asia financial crisis and your personal involvement has helped bring us closer to a historic bilateral agreement on China's accession to the WTO. Such an agreement would benefit both countries. It would help China to consolidate its reforms and to compete in the new global economy. It would lend new momentum to our economic relations based on fair and more open rules of investment and trade. Mr. Premier, through the years, our two countries have learned that normal relations do not mean untroubled relations, and I know that you have a reputation for being direct. In our earlier meetings, I have found that to be true and, I, too, am fond of plain speaking. In that spirit, I am pleased that you will have the opportunity during your visit to discuss issues that divide us as well as those upon which we have a common view. For example, the United States is convinced that NATO is doing the right thing in responding to the great humanitarian tragedy in Kosovo. I hope that as you travel around our country, you will understand how deeply Americans feel about the importance and universality of such fundamental principles as free expression, freedom of religion and the freedom of press. This morning in your very bold and interesting welcoming statement, you did speak about the freedom-loving people of America. The convictions that we hold are not held by a shrill minority but rather by the vast majority of Americans and are reflected in our relations with all countries. Mr. Premier, in your Wall Street Journal interview, you were asked to describe yourself succinctly. You replied that you were an ordinary Chinese person who is, at the same time, Premier of China. I like that description, Mr. Premier, because I believe that the United States and China are most likely to make progress when we think in terms of what is best for ordinary people in both our countries. For that is when we focus on the long-term promise that lies beyond the immediate problems in our relationship. That is what keeps us striving to find additional areas where we cooperate in promoting a more stable and prosperous Asia and a more peaceful world. Mr. Premier, President Clinton and President Jiang were right to set our nations on the path toward constructive, strategic partnership. The United States remains committed to principled and purposeful engagement with China. That means, we will be honest with you about differences but, also, that we want to work with you to the benefit of ordinary people on both sides of the Pacific for decades to come. Now, I would like to have you all join me in a toast to the health of Premier Zhu and Madame Lao, to the success of their visit to the United States and to the future development and progress of relations between our two great countries. PREMIER ZHU [through interpreter]: Madame Secretary of State, ladies and gentlemen, it's really a great pleasure for the delegation of the People's Republic of China to have come to the beautiful city of Washington, DC and also have come to the beautiful country of the United States of America for a visit. I feel all the more delighted to see so many old friends and the good friends of mine present at this very grand welcoming luncheon hosted by Secretary Albright for us. Madame Secretary said that I'm a person known for being direct so, today, I'd like to be very honest with you. I had been quite reluctant to make this trip to tell you the truth. Yesterday, she discussed for more than 20 minutes with me on the Kosovo question, and she said that your positions on Kosovo are right. Then I said, "No." (Laughter.) Just now in her speech she said that I mentioned that the American people are freedom-loving people. But she didn't mention that I also said, "The Chinese people are a peace-loving people." I don't want to go on arguing (laughter) as you are the gracious hostess, I don't want to argue with you. I can tell you that this morning, I already had very good discussions with President Clinton and also Secretary Albright and other colleagues. I can say that the discussions were friendly, frank, constructive and productive. I think that would be a very auspicious omen to show that visit this time by the delegation of the PRC to the United States will be a great success. After Washington, we are also going to Denver, Chicago, New York and Boston. I hope that I will have very extensive contacts with the American people. As I said in China, one of the purposes of my current visit to the United States is try to cool some Americans down. To do that, to cool them down, I think I need to make explanations and clarifications of the facts. We also need to discuss a lot of issues. To discuss issues, it is inevitable that some times we may argue with each other. But I think I have a quite similar character as the Americans, so I think we can have very good conversations, and we will not fight. I recall my last visit to the United States in 1990, when I headed a mayor's delegation as the mayor of Shanghai. At that time, China-US relations were at its lowest ebb or in its most difficult time. On the 24th of May, I went to Capitol Hill and I spent the whole day there having discussions with 24 members of the Congress. Of course, most of our discussions were like a debate. But I think we had very good conversations. As I was about to leave Capitol Hill, I encountered Senator Helms at the door. We also chatted for awhile at the door. So altogether, during that day, I had conversations with 25 members of the US Congress. As I had such good conversations with so many members of the Congress at that difficult period in our relations, so I think -- I believe today, I will be able to have a very good contacts and communications with the American people and their representatives. I have confidence that my visit to the United States this time will be successful. I feel all the more confident when I see so many good friends of mine here welcoming me. PRESIDENT JIANG: Ladies and gentlemen, just now I've held official talks with President Clinton. The two sides have held an extensive and in-depth exchange of views on China-U. S. relations and the major international and regional issues. The talks were positive, constructive, and productive. The successful exchange of visits between the two heads of state of China and the United States marks a new stage of growth for China-U. S. relations. This not only serves the common interests of China and the United States, but also will be of important significance to promoting peace, stability, and prosperity in the Asia Pacific and the world at large. China-U. S. relations are improving and growing. The cooperation between the two sides in many areas has made important progress. President Clinton and I have decided that China and the United States will not target the strategic nuclear weapons under their respective control at each other. This demonstrates to the entire world that China and the United States are partners, not adversaries. The Taiwan question is the most important and the most sensitive issue at the core of China-U. S. relations. We hope that the U. S. side will adhere to the principles set forth in the three China-U. S. joint communiques and the joint China-U. S. statement, as well as the relevant commitments it has made in the interest of a smooth growth of China-U. S. relations. The improvement and the growth of China-U. S. relations have not come by easily. It is the result of the concerted efforts of the governments and people of our two countries. So we should all the more treasure this good result. As China and the United States have different social systems, ideologies, values, and culture traditions, we have some difference of views on certain issues. However, they should not become the obstacles in the way of the growth of China-U. S. relations. The world is a colorful one. The development parts of the countries in the world should be chosen by the people of the countries concerned. China and the United States should view and handle the bilateral relations from a long-term and strategic perspective. We should promote the growth of China-U. S. relations in the spirit of mutual respect, equality, mutual benefit, seeking common ground while putting aside differences, and developing cooperation. I believe that through the concerted efforts of both sides, we will make constant progress in the direction of building a constructive, strategic partnership between China and the United States oriented towards the 21st century. Earlier this morning, during my official welcome, I could hear and seethe many echoes of China's past and the call of its promising future, for Tiananmen Square is an historical place. There, 100 years ago, China's quest for constitutional government was born. There, in 1919, young people rallied against foreign occupation and launched a powerful movement for China's political and cultural renewal. There, in 1976, public mourning for Zhou Enlai led to the Cultural Revolution's end and the beginning of your remarkable transformation. And there, nine years ago, Chinese citizens of all ages raised their voices for democracy. PRESIDENT JIANG: Now President Clinton and I are prepared to answer your questions, and now I'd like to give the first question to President Clinton. PRESIDENT CLINTON: Which one -- Chinese journalists, one of you? In the back there, yes? Yes, go ahead. Q: Thank you. I'm a correspondent with Phoenix TV of Hong Kong. In the recent Asian financial crisis, the Chinese government has pledged to maintain the value of RMB Asian currency and, thus, making positive contribution to stabilizing the situation in Asia. And this has attracted positive reaction from the international community and from the U. S. government. However, yesterday, the exchange rate between Japanese yen and the U. S. dollar dropped again to a low of 143 yen against one dollar, and which was closed at 141 yen against one dollar. So, what specific common measures are the Chinese and the U. S. government prepared to take to stabilize the financial situation in Asia and the world? PRESIDENT CLINTON: Well, first of all, let me agree with you. I think that China has shown great statesmanship and strength in making a strong contribution to the stability not only of the Chinese people and their economy, but the entire region, by maintaining the value of its currency. The key here, I believe, is for the plans to reform the financial institutions in Japan and take other steps that will get growth going and get investments going in Japan to be made. I think that, ultimately, President Jiang and I would give anything to be able to just wave a wand and have all of this go away. We are not the only actors in this drama, and a lot of this must be done by the Japanese government and the Japanese people. We can be supportive, but they have to machete right decisions. Q: My question to President Jiang and also to President Clinton is, we know that there were four dissidents in Xian who were arrested earlier and three were released, and one of them is still under detainment. And I would like to know if you talked about the issue. And what about the rest of the 2, 000 dissidents who are being reported as still under imprisonment right now in China? Can both of you elaborate on that? Thank you. As for the question you raised, actually, I do not have very detailed information in this regard. But as for the latter part of your question concerning 2, 000 dissidents, I think in China we have our laws. And in China's constitution, it is clearly stipulated that the Chinese citizen shave the freedom of speech, but any law-breaking activities must be dealt with according to law. I think this is true in any country of rule of law. And I think China's judicial departments will deal with the matter according to law. Q: President Jiang spoke of China's position against the first use of nuclear weapons and the policy of the United States does not agree. Was this discussed in the context of negotiations on the detargeting agreement? And what are the U. S. concessions in order to obtain the detargeting agreement? PRESIDENT JIANG: I would like to make a brief explanation. As I stated just now, President Clinton and I decided that China and the United States would not target the strategic nuclear weapons under their respective control at each other. Full stop -- that's a full stop. And then this demonstrates to the entire world that China and the United States are partners, not adversaries. Full stop again. (Laughter. )And then I said, I hereby reiterate that since the very first day that China came into possession of nuclear weapons, China has undertaken not to be the first to use nuclear weapons under any circumstances. Full stop. That's my view. That's our view. PRESIDENT JIANG: China and the United States have differences of views and also have common ground on the human rights issue. More than 2, 000 years ago, a great thinker of China's Han Dynasty, Dong Zhongshu, once said, "Of all the living things nurtured between heaven and the Earth, the most valuable is human beings. " So the Chinese nation always respects and maintains the dignity and rights of the people. Today the Chinese government solemnly commits itself to the promotion and the protection of human rights and fundamental freedoms. The United States is the most developed country in the world, with a per capita GDP approaching $30, 000 U. S. dollars, while China is a developing country with a population of 1. 2 billion, with a per capita GDP of less than $700 U. S. dollars. As the two countries differ in social system, ideology, historical tradition and cultural background, the two countries have different means and ways in realizing human rights and fundamental freedoms. So it's nothing strange that we may have some difference of views over some issues. The Chinese who are here understand better than I the price paid overtime at various moments in history for disruption and upheaval in China, so there is an understandable desire to have stability in the country. Every country wants stability. PRESIDENT JIANG: I'm sorry, I have to take up an additional five minutes. (Laughter. ) So I'd like to say a few words on Dalai Lama. President Clinton is also interested in this question, in Dalai Lama. Actually, since the Dalai Lama left in 1959, earthshaking changes have taken place in Tibet. As for the freedom of religious belief, there is fierce* stipulations in our constitution for the protection of religious belief and this also includes in Tibet. And we have also spent a lot of money in renovating the lamas is and temples in Tibet. And we have spent $100 million RMB-yuan and one ton of gold in renovating the Budala Palace. At the invitation of President William J. Clinton of the United States of America, President Jiang Zemin of the People's Republic of China is paying a state visit to the United States from October 26 to November 3, 1997. This is the first state visit by the President of China to the United States in twelve years. President Jiang Zemin held formal talks with President Clinton in Washington D.C. and also met with Vice President Al Gore, Congressional leaders and other American leaders. Talks also were held between Vice Premier and Foreign Minister Qian Qichen and Secretary of State Madeleine Albright. The two Presidents had in-depth and productive exchange of views on the international situation. U.S.-China relations and the important opportunities and challenges facing the two countries. They agree that a sound and stable relationship between the United States and China serves the fundamental interests of both the American and Chinese peoples and is important to fulfilling their common responsibility to work for peace and prosperity in the 21st century. They agree that while the United States and China have areas of both agreement and disagreement, they have a significant common interest and a firm common will to seize opportunities and meet challenges cooperatively, with candor and a determination to achieve concrete progress. 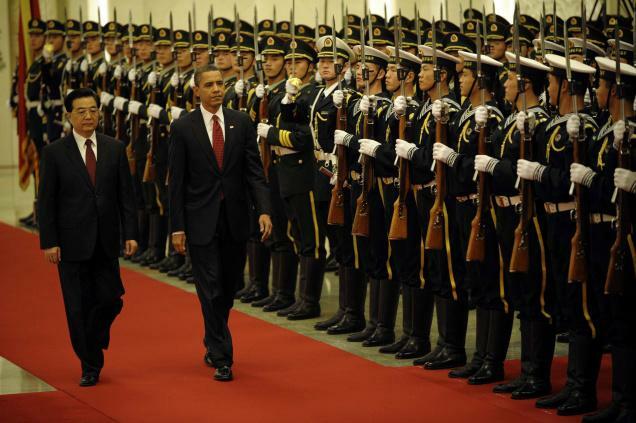 The United States and China have major differences on the question of human rights. At the same time, they also have great potential for cooperation in maintaining global and regional peace and stability; promoting world economic growth; preventing the proliferation of weapons of mass destruction; advancing Asia-Pacific regional cooperation; combating narcotics trafficking, international organized crime and terrorism; strengthening bilateral exchanges and cooperation in economic development, trade, law, environmental protection, energy, science and technology, and education and culture; as well as engaging in military exchanges. The two Presidents are determined to build toward a constructive strategic partnership between the United States and China through increasing cooperation to meet international challenges and promote peace and development in the world. To achieve this goal, they agree to approach U.S.-China relations from a long-term perspective on the basis of the principles of the three U.S.-China joint communiqués. China stresses that the Taiwan question is the most important and sensitive central question in China-U.S. relations, and that the proper handling of this question in strict compliance with the principles set forth in the three China-U.S. joint communiqués holds the key to sound and stable growth of China-U.S. relations. The United States reiterates that it adheres to its "one China" policy and the principles set forth in the three U.S.-China joint communiqués. As permanent members of the United Nations Security Council, the United States and China support the UN in its efforts, in accordance with the purposes and principles of the UN Charter, to play a positive and effective role on global issues, including peacekeeping and the promotion of economic and social development. Both countries support efforts to reform the UN and to make the Security Council more representative, while retaining and improving its effectiveness. Stressing the need to put the UN on a firmer financial, both countries will participate actively in discussions on the Scale of Assessments in the UN. As two major countries in the Asia-Pacific region, the United States and China are ready to strengthen their cooperation to meet various challenges and make positive contributions to promoting stability and prosperity in the region. Recognizing that maintenance of peace and stability on the Korean Peninsula is of great importance, the two countries are working through the Four-Party Talks to help establish a durable peace on the Peninsula, and will continue consultations to this end. They also stress that it is in the interest of the two countries to maintain peace and stability in other important regions, including the Middle East, the Gulf, and South Asia. The two Presidents agreed on a number of steps that will provide a framework for further promoting U.S.-China relations and strengthening their cooperation in international affairs. The United States and China agree to regular visits by their Presidents to each other's capitals. They agree to a Washington-Beijing presidential communications link to facilitate direct contact. They also agree to regular exchanges of visits by Cabinet and sub-cabinet officials to consult on political, military, security and arms control issues. The United States and China reaffirm the importance of bilateral cooperation across the broad range of environmental issues, as evidenced by the establishment of the U.S.-China Forum on Environment and Development in March 1997. They consider it a critical challenge to develop and efficiently use energy sources, protect the global environment, and promote environmentally sound growth and development. Accordingly, they agree to strengthen their cooperation in energy and environment through an initiative to accelerate clean energy projects and the appropriate transfer of related technologies. The principal areas of cooperation will be in clean energy, urban air pollution control and rural electrification. This initiative also wilpl foster broader cooperation on global environment issues such as climate change, desertification and bio-diversity. China's State Planning Commission and the U.S. Energy Department have signed the U.S.-China Initiative on Energy and Environment Cooperation to promote effective cooperation in these fields, including the use of clean energy. The two Presidents are prepared to take positive and effective measures to expand U.S.-China trade and economic ties. As both economies move into the 21st century, information technology will be critical to spurring technological innovation and improving productivity. In this regard, China indicated its intention to participate as soon as possible in the Information Technology Agreement. In addition, in the context of WTO negotiations, China will continue to make further substantial tariff reductions. The United States and China agree that China's full participation in the multilateral trading system is in their mutual interest. To this end, they agree to intensify negotiations on market access, including tariffs, non-tariff measures, services, standards and agriculture and on implementation of WTO principles so that China can accede o the WTO on a commercially meaningful basis at the earliest possible date. The United States and China agree that it is in their mutual interest to cooperate in the peaceful uses of nuclear energy. To this end, they each have taken the steps necessary to implement the U.S.-China Agreement on Peaceful Nuclear Cooperation concluded in 1985. In addition, China's State Planning Commission and the U.S. Department of Energy have signed an Agreement of Intent to promote peaceful nuclear cooperation and research between the two countries. The United States and China agree to work to bring the Comprehensive Test Ban Treaty into force at the earliest possible date. They also agree to pursue at the UN Conference on Disarmament the early start of formal negotiations on the Treaty on the Prohibition of the Production of Fissile Materials Use in Nuclear Weapons and Other Nuclear Explosive Devices. The United States and China reiterate their commitment not to provide any assistance to unsafeguarded nuclear facilities and nuclear explosion programs. China has placed controls on exports of nuclear and dual-use materials and related technology and will take further measures to strengthen dual-use export controls by mid-1998. The United States will continue to enforce firm controls on the export of nuclear and dual-use materials and related technology. As original parties to the Chemical Weapons Convention, the United States and China agree to cooperate in implementing the Convention within a multilateral framework. Both countries agree on the importance of government oversight of chemical-related exports. The United States and China agree to build on the 1994 Joint Statement on Missile Nonproliferation. They reaffirm their respective commitments to the guidelines and parameters of the Missile Technology Control Regime (MTCR). The United States and China both recognize the positive role of the Universal Declaration on Human Rights and other international human rights instruments in promoting human rights. They reiterate their commitment to the promotion and protection of human rights and fundamental freedoms. While the two countries have not resolved their differences on human rights, they have agreed to discuss them through dialogue at both governmental and non-governmental levels in the spirit of equality and mutual respect. The two countries agree to hold discussions on the structure and functions of an NGO forum on human rights. The United States and China agree that promoting cooperation in the field of law serves the interests and needs of both countries. They will strengthen cooperation in combating international organized crime, narcotics trafficking, alien smuggling, counterfeiting and money laundering. To this end, they intend to establish a joint liaison group for law enforcement cooperation composed of representatives of the relevant agencies of both governments. They agree to begin consultations on mutual legal assistance aimed at concluding a mutual legal assistance agreement. The United States and China will assign counternarcotics officers to their respective embassies on a reciprocal basis. Recognizing the importance the United States and China each attaches to legal exchanges, they intend to establish a joint liaison group to pursue cooperative activities in this area. These may include exchanges of legal experts; training of judges and lawyers; strengthening legal information systems and the exchange of legal materials; sharing ideas about legal assistance; consulting on administrative procedures; and strengthening commercial law and arbitration. As part of this program of legal cooperation, China's Minister of Justice will visit the United States in November 1997 at the invitation of the U.S. Attorney General. The United States and China have reached agreement on the establishment of a consultation mechanism to strengthen military maritime safety, which will enable their maritime and air forces to avoid accidents, misunderstandings or miscalculations. They agree to share information and discuss issues related to their respective experiences in the areas of humanitarian assistance and disaster relief. The U.S.-China Joint Commission on Science and Technology will continue to guide the active bilateral scientific and technological cooperation program, which involves more than 30 agreements reached since 1979, and will promote the further use of science and technology to solve national and global problems. The United States and China will identify areas for cooperative projects using space for Earth science research and practical applications. The United States and China will expand educational and cultural exchanges. Both Presidents believe that increased people-to-people exchanges will help cultivate long-term bilateral relations. President Jiang Zemin expressed his thanks to President Clinton and the American people for their warm reception and invited President Clinton to visit China in 1998. President Clinton accepted this invitation with pleasure. President Jiang, Mrs. Wang, members of the Chinese delegation, welcome to the White House, and welcome to America. Mr. President, your visit gives us both an opportunity and a responsibility. At the dawn of a new century and a new millenium, let us strengthen the bonds between us; let us pursue common causes; let us address our differences openly and with respect; let us build a better world for our children. As we cast our eyees over the horizon and toward the future, one thing is absolutely clear: China, with its ancient civilization and renewed economic and political vigor, will have a profound influence on the new world of the 21st century. How China defines its greatness will shape the future for all the world's children. Mr. President, together, we can make this new era the brightest chapter in China's long and rich history, the best days America has ever known, and a new age of unprecedented peace and prosperity for all the world. That, Mr. President, is the future we hope for as we welcome you to the United States. Mr. President and Mrs. Clinton, ladies and gentlemen. Let me thank you, Mr. President, for your kind invitation. It is with great pleasure that I have come to the United States of America for a state visit. I wish to take this opportunity to convey to the great American people the cordial greetings and best wishes of the 1.2 billion Chinese people. Eighteen years ago, Mr. Deng Xiaoping solemnly announced here that a new era for Sino-American relations had begun. Today the Chinese people have sent me on this mission to the United States to enhance mutual understanding, broaden common ground, develop cooperation, and build a future together, and to bring out relationship into a new stage of development. On the eve of the 21st century, people all over the world are looking forward to a new century full of hope and our planet blessed with peace, tranquility and prosperity for mankind. Both China and the United States are countries that carry considerable weight in the world. In the new international situation, the shared interests between China and the United States have increased, rather than decreased. Our potential for cooperation has expanded, rather than diminished. Our two countries share broad common interests and shoulder a common responsibility on major issues bearing upon human survival and development. All the people in the world and persons of insight are following closely the course of development of China-U.S. relations. We should view and handle our relations from an historical height and with a strategic perspective. The past quarter of a century has witnessed the conclusion of three China-U.S. joint communiques which facilitated expansion of our exchanges and cooperation in various fields and proper handling of differences between our two countries. I believe that so long as we continue to strictly abide by the principles set forth in the three China-U.S. joint communiques, China-U.S. relations will advance steadily and soundly. I hope that the development of China-U.S. will positively promote mutual respect, peaceful coexistence and common development of all countries in the world, different in history, culture, social system and level of development. Let us, the Chinese and the Americans, join hands and, together, with people around the world, work hard to bring about a new century of peace, stability and prosperity. Allow me to thank you, Mr. President, once again for your warm welcome. Thank you all. 1. In the Joint Communique on the Establishment of Diplomatic Relations on January 1, 1979, issued by the Government of the United States of America and the Government of the People's Republic of China, the United States of America recognized the Government of the People's Republic of China as the sole legal government of China, and it acknowledged the Chinese position that there is but one China and Taiwan is part of China. Within that context, the two sides agreed that the people of the United States would continue to maintain cultural, commercial, and other unofficial relations with the people of Taiwan. On this basis, relations between the United States and China were normalized. 2. The question of United States arms sales to Taiwan was not settled in the course of negotiations between the two countries on establishing diplomatic relations. The two sides held differing positions, and the Chinese side stated that it would raise the issue again following normalization. Recognizing that this issue would seriously hamper the development of United States-China relations, they have held further discussions on it, during and since the meetings between President Ronald Reagan and Premier Zhao Ziyang and between Secretary of State Alexander M. Haig, Jr., and Vice Premier and Foreign Minister Huang Hua in October 1981. 3. Respect for each other's sovereignty and territorial integrity and non-interference each other's internal affairs constitute the fundamental principles guiding United States-China relations. These principles were confirmed in the Shanghai Communique of February 28, 1972 and reaffirmed in the Joint Communique on the Establishment of Diplomatic Relations which came into effect on January 1, 1973. Both sides emphatically state that these principles continue to govern all aspects of their relations. 4. The Chinese government reiterates that the question of Taiwan is China's internal affair. The Message to the Compatriots in Taiwan issued by China on January 1, 1979, promulgated a fundamental policy of striving for Peaceful reunification of the Motherland. The Nine-Point Proposal put forward by China on September 30, 1981 represented a Further major effort under this fundamental policy to strive for a peaceful solution to the Taiwan question. 5. The United States Government attaches great importance to its relations with China, and reiterates that it has no intention of infringing on Chinese sovereignty and territorial integrity, or interfering in China's internal affairs, or pursuing a policy of "two Chinas" or "one China, one Taiwan." The United States Government understands and appreciates the Chinese policy of striving for a peaceful resolution of the Taiwan question as indicated in China's Message to Compatriots in Taiwan issued on January 1, 1979 and the Nine-Point Proposal put forward by China on September 30, 1981. The new situation which has emerged with regard to the Taiwan question also provides favorable conditions for the settlement of United States-China differences over the question of United States arms sales to Taiwan. 6. Having in mind the foregoing statements of both sides, the United States Government states that it does not seek to carry out a long-term policy of arms sales to Taiwan, that its arms sales to Taiwan will not exceed, either in qualitative or in quantitative terms, the level of those supplied in recent years since the establishment of diplomatic relations between the United States and China, and that it intends to reduce gradually its sales of arms to Taiwan, leading over a period of time to a final resolution. In so stating, the United States acknowledges China's consistent position regarding the thorough settlement of this issue. 7. In order to bring about, over a period of time, a final settlement of the question of United States arms sales to Taiwan, which is an issue rooted in history, the two governments will make every effort to adopt measures and create conditions conducive to the thorough settlement of this issue. 8. The development of United States-China relations is not only in the interest of the two peoples but also conducive to peace and stability in the world. The two sides are determined, on the principle of equality and mutual benefit, to strengthen their- ties to the economic, cultural, educational, scientific, technological and other fields and make strong. joint efforts for the continued development of relations between the governments and peoples of the United States and China. 9. In order to bring about the healthy development of United States China relations, maintain world peace and oppose aggression and expansion, the two governments reaffirm the principles agreed on by the two sides in the Shanghai Communique and the Joint Communique on the Establishment of Diplomatic Relations. The two sides will maintain contact and hold appropriate consultations on bilateral and international issues of common interest. President Nixon met with Chairman Mao Tse-tung of the Communist Party of China on February 21. The two leaders had a serious and frank exchange of views on Sino-U.S. relations and world affairs. The U.S. side stated: Peace in Asia and peace in the world requires efforts both to reduce immediate tensions and to eliminate the basic causes of conflict. The United States will work for a just and secure peace: just, because it fulfills the aspirations of peoples and nations for freedom and progress; secure, because it removes the danger of foreign aggression. The United States supports individual freedom and social progress for all the peoples of the world, free of outside pressure or intervention. The United States believes that the effort to reduce tensions is served by improving communication between countries that through accident, miscalculation or misunderstanding. Countries should treat each other with mutual respect and be willing to compete peacefully, letting performance be the ultimate judge. No country should claim infallibility and each country should be prepared to re-examine its own attitudes for the common good. The United States stressed that. the peoples of Indochina should be allowed to determine their destiny without outside intervention; its constant primary objective has been a negotiated solution; the eight-point proposal put forward by the Republic of Vietnam and the United States on January 27, 1972 represents a basis for the attainment of that objective; in the absence of a negotiated settlement the United States envisages the ultimate withdrawal of all U.S. forces from the region consistent with the aim of self determination for each country of Indochina. The United States will maintain its close ties with and support for the Republic of Korea; the United States will support efforts of the Republic of Korea to seek a relaxation of tension and increased communication in the Korean peninsula. The United States places the highest value on its friendly relations with Japan; it will continue to develop the existing close bonds. Consistent with the United Nations Security Council Resolution of December 21, 1971, the United States favors the continuation of the ceasefire between India and Pakistan and the withdrawal of all military forces to within their own territories and to their own sides of the ceasefire line in Jammu and Kashmir; the United States supports the right of the peoples of South Asia to shape their own future in peace, free of military threat, and without having the area become the subject of great power rivalry. The Chinese side stated: Wherever there is oppression, there is resistance. Countries want independence, nations want liberation and the people want revolution--this has become the irresistible trend of history. All nations, big or small, should be equal; big nations should not bully the small and strong nations should not bully the weak. China will never be a superpower and it opposes hegemony and power politics of any kind. The Chinese side stated that it firmly supports the struggles of all the oppressed people and nations for freedom and liberation and that the people of all countries have the right to choose their social systems according to their own wishes and the right to safeguard the independence, sovereignty and territorial integrity of their own countries and oppose foreign aggression, interference, control and subversion. All foreign troops should be withdrawn to their own countries. The Chinese side expressed its firm support to the peoples of Vietnam, Laos and Cambodia in their efforts for the attainment of their goal and its firm support to the seven-point proposal of the Provisional Revolutionary Government of the Republic of South Vietnam and the elaboration of February this year on the two key problems in the proposal, and to the Joint Declaration of the Summit Conference of the Indochinese Peoples. It firmly supports the eight-point program for the peaceful unification of Korea put forward by the Government of the Democratic People's Republic of Korea on April 12, 1971, and the stand for the abolition of the "U.N. Commission for the Unification and Rehabilitation of Korea." It firmly opposes the revival and outward expansion of Japanese militarism and firmly supports the Japanese people's desire to build an independent, democratic, peaceful and neutral Japan. It firmly maintains that India and Pakistan should, in accordance with the United Nations resolutions on the India-Pakistan question, immediately withdraw all their forces to their respective territories and to their own sides of the ceasefire line in Jammu and Kashmir and firmly supports the Pakistan Government and people in their struggle to preserve their independence and sovereignty and the people of Jammu and Kashmir in their struggle for the right of self determination. The two sides reviewed the long-standing serious disputes between China and the United States. The Chinese reaffirmed its position: The Taiwan question is the crucial question obstructing the normalization of relations between China and the United States; the Government of the People's Republic of China is the sole legal government of China; Taiwan is a province of China which has long been returned to the motherland; the liberation of Taiwan is China's internal affair in which no other country has the right to interfere; and all U.S. forces and military installations must be withdrawn from Taiwan. The Chinese Government firmly opposes any activities which aim at the creation of "one China, one Taiwan," "one China, two governments," "two Chinas," and "independent Taiwan" or advocate that "the status of Taiwan remains to be determined." The U.S. side declared: The United States acknowledges that all Chinese on either side of the Taiwan Strait maintain there is but one China and that Taiwan is a part of China. The United States Government does not challenge that position. It reaffirms its interest in a peaceful settlement of the Taiwan question by the Chinese them-selves. With this prospect in mind, it affirms the ultimate objective of the withdrawal of all U.S. forces and military installations from Taiwan. In the meantime, it will progressively reduce its forces and military installations on Taiwan as the tension in the area diminishes. In the Communiqué, both nations pledged to work toward the full normalization of diplomatic relations. The United States acknowledged the Chinese position that all Chinese on both sides of the Taiwan Strait maintain that there is only one China and that Taiwan is part of China. The statement enabled the United States and China to temporarily set aside the "crucial question obstructing the normalization of relations"--Taiwan--and to open trade and other contacts. In May 1973, in an effort to build toward the establishment of formal diplomatic relations, the United States and China established the United States Liaison Office (USLO) in Beijing and a counterpart Chinese office in Washington, DC. U.S. President Ford visited China in 1975 and reaffirmed the U.S. interest in normalizing relations with Beijing. Shortly after taking office in 1977, President Carter again reaffirmed the interest expressed in the Shanghai Communiqué. The United States and China announced on December 15, 1978, that the two governments would establish diplomatic relations on January 1, 1979. In the Joint Communiqué on the Establishment of Diplomatic Relations dated January 1, 1979, the United States transferred diplomatic recognition from Taipei to Beijing. The United States reiterated the Shanghai Communiqué's acknowledgment of the Chinese position that there is only one China and that Taiwan is a part of China; Beijing acknowledged that the American people would continue to carry on commercial, cultural, and other unofficial contacts with the people of Taiwan. The Taiwan Relations Act made the necessary changes in U.S. domestic law to permit such unofficial relations with Taiwan to flourish. On March 1, 1979, the United States and China formally established embassies in Beijing and Washington, DC.